Time moves differently down by the river. The Thames, tidal here, slips slowly by. Quiet and contemplative, I bask in the sun’s warmth. Its light is doubled, its twin reflected back at me from the water. I am content to accept sensory experiences as they come and go without acting upon them. It is enough to feel time passing. To become a still rock the current of life flows over and around. The noise of the city drops away and even the aeroplanes flying low over the opposite bank seem subdued, respecting my quiet mood. 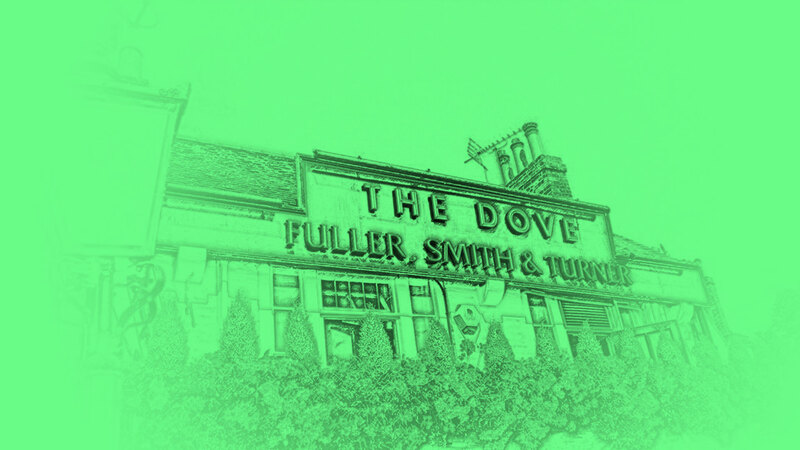 The Dove in Hammersmith is a pub I once knew well and have long remembered fondly. Despite this I hadn’t revisited it in many years. I’d always meant to, but life moves on and takes you to different areas. Somehow I’d never found a reason to make the trip back, even though it isn’t a particularly long one. Recently though I was called back to west London for a seminar. When my work commitments ended earlier than expected, there was no question where I was headed next. I found the Dove much as it had been all those years ago. It’s one of those comfily huddled little back-street jobs – a real hidden treasure. Immediately upon stepping through the door, eyes still adjusting to the move from light to dark, you’re at the tiny bar. It’s all Fuller’s beer. Beyond the bar and up a couple of steps is the main part of the pub, with windows looking out onto a few more tables and the river. Inside all was quiet. From time to time the wooden floors would ring to the footsteps of people passing from door to bar to terrace, but no one stayed in there. It was too nice a day. It was late September but felt like summer: 22°C and sunny, a gentle breeze and not a cloud to be seen. Even though it was well into the afternoon, the Dove’s riverside terrace was alive with the gentle murmur of people enjoying a leisurely midweek lunch answered by the unhurried clatter of plates from the kitchen inside. The tables were full without it feeling cramped or busy. We sat together drinking good beer in the sun and taking pleasure in existing. I saw pints of session IPA and stout, and halves of lager sparkling in the sun reflected off the water. Sparkles on the river, sparkling bubbles in the beer. There were retirees, tourists, and a smattering of people who looked like they ought to have something better to do – although really what better is there to do than this? Of course some things had changed since I was last here. Not least the fact that people have smartphones now, which they were using to take photos. The view was picture postcard perfect. The good old Thames looked its best, with its greenish brown water transformed by the light into a rich and deeply coloured jewel. Along its banks puffy trees still in leaf were punctuated by cranes, flagpoles and the occasional building. I heard gulls calling and distant helicopters burbling through the air. Further downstream boats shuttled about. Tenders and launches towed their wakes behind them. Slender eights perched on the water like pond skaters held up by surface tension. “Remember when we used to walk down to Twickenham?” a husband at the next table asked his wife. And just like that the years slipped away. I remembered towpath life. Jetties. Steps down to the water. Lunches outside whitewashed pubs in dappled sunlight, hard by a lock with boats moored up. We are in boat race territory. Long after Londoners stopped using the Thames as the city’s central artery there remain areas where locals lives turn to the river and its banks – at least when there’s time enough for leisure to allow it. “We could take a boat back home, it would be quicker,” the wife quips. Of course there is no boat going that way but the idea persists. The soul of riverine London connects neighbourhoods in a different way than roads or tube lines ever could, and creates its own geography. London by the Thames, especially to the west of the city, is not the same as the rest of town. And it’s a cracking spot for a beer.